It was once the place to be. Here you could be transported to other worlds and other times, forget your troubles and let your imagination run wild. You can still let your imagination play here, but your thoughts are likely to take a darker turn. Palaces built for fantasy must inevitably decay into harsh reality. Can your coming attraction be told in 55 words? Tell Mr. Know-It-All! love this. always a pleasure to read you. It is sooo sad when they decay! 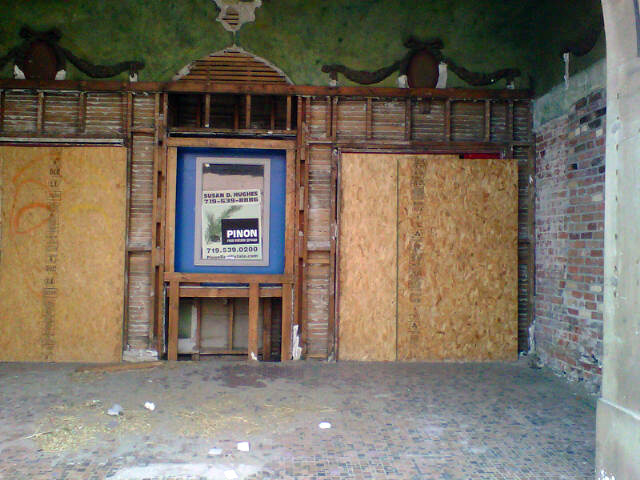 I hate to see them all boarded up! I can't explain it, but I really appreciate the loyal supporters like YOU. Is that a movie palace? 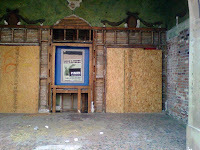 There's nothing sadder than to see a grand old theater decay. 35793570Still, it's an awfully tempting place to visit. Loved this 55! And I must have done something wrong in my post because what the heck are those numbers? Oh yeah - the verification code posted in the wrong place - lol! About 30 miles or so from where I live there is a place that looks like a palace. It used to be a spaghetti joint, then I think it was a pizza place. I'm not sure what it is now. I never get to that part of the world any more.